Autoimmune diseases are illnesses wherein healthy body tissues and cells are mistakenly attacked by the body’s immune system. While normally designed to seek and destroy infectious agents, the immune system of a patient with an autoimmune disease is unable to tell the difference between normal cells and foreign pathogens. This then results in the destruction of healthy body tissue which can then cause abnormal organ growth or changes in organ function. Currently, there is no known cause for autoimmune disease. A number of experts believe that the answer may lie in certain drugs or microorganisms confusing the immune system. In addition, various risk factors are known to increase the likelihood of developing an autoimmune disease. According to HopkinsMedicine.org, these include being overweight, having a predilection to smoking, or having relatives who already have autoimmune disease. Moreover, some people more predisposed to getting an autoimmune disease. For instance, women, particularly women of child-bearing age, are at higher risk than men. Type 1 diabetes: Insulin-producing pancreatic cells are attacked, resulting in high blood sugar that damages several bodily organs. Rheumatoid arthritis: A condition wherein the joints throughout the body become inflamed. Unlike osteoarthritis which manifests later in life, rheumatoid arthritis can manifest much earlier. Psoriasis or psoriatic arthritis: A chronic skin condition wherein skin cells grow too quickly. Psoriasis can sometimes lead to psoriatic arthritis, a type of inflammatory arthritis that impacts the large joints, causing them to stiffen and swell up. Sjögren’s syndrome: The affected parts are the joints and the glands that produce tears and saliva. Vasculitis: This occurs when the immune system attacks blood vessels, leading to inflammation that narrows the veins and arteries. Pernicious anemia: The body is unable to absorb vitamin B12 and then becomes deficient of this vitamin. Older adults are more prone to pernicious anemia. Celiac disease: People with this condition are unable to consume gluten, as it can cause the immune system to attack and inflame the intestine. 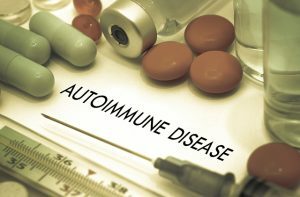 Many autoimmune disease will oftentimes have unique symptoms, however. Psoriasis, for example, is characterized by thick and scaly skin patches, while inflammatory bowel disease is marked by diarrhea and bloating. Taking drugs such as nonsteroidal anti-inflammatory drugs or immune-suppressing drugs. Making dietary changes: While gluten should be avoided by those with Celiac disease, other foods such as dairy, nuts, and soy, are common allergens that can trigger allergic reactions and exacerbate the immune systems. Avoid or limit the consumption of these foods. On the other hand, eating foods rich in calcium, magnesium, and vitamin B12 can help against autoimmune disease. Managing stress: Chronic stress has been known to tax the immune system, so make it a point to avoid stress as often as possible. Meditation and tai chi can help in this regard, as can getting enough sleep on a daily basis. People with autoimmune disease have overacting immune systems unable that harm healthy cells and tissues. There are more than 80 kinds of autoimmune disease which affect numerous parts of the human body, such as the muscles, skin, red blood cells, and connective tissues. An autoimmune disease can cause a person to experience a wide range of symptoms like fatigue, hair loss, numbness in their hands and feet, and skin rashes. Treatment of autoimmune disease calls for managing the symptoms and controlling the immune system, which can be accomplished through medical assistance as well as changes to one’s diet and maintenance of stress levels.